Saint Basil the Great was the founder and organizer of coenobitic monasticism. His rules, and the reforms introduced by Saint Theodore the Studite, are still in place to this day. 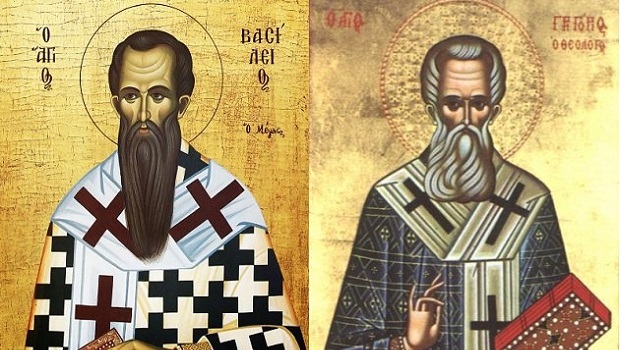 Of course, Saint Basil was not involved with monasticism in an amateur fashion. He was himself a monk and lived the monastic life for a good many years. Even from the time when he was studying in Athens, he planned to withdraw into the desert with his friend Saint Gregory the Theologian, when they had completed their studies. Later he was to regard the time he spent studying as a waste. He wrote in an epistle to Efstathios of Sevasteia: “I spent a great deal of time on futile efforts and consumed almost all my youth in vain pursuits, where I dedicated myself to the acquisition of the teachings of the wisdom which God has withered. When I awoke, as it were from a deep sleep, I looked towards the wondrous light of the Gospel, saw the uselessness of the wisdom of the obsolete rulers of this age, mourned my miserable life and prayed to be given guidance to be introduced into the dogmas of true devotion. More than anything, I took care to correct my own way of life, which had become somewhat distorted from my acquaintance with unsavoury people. So when I had read the Gospel and therein encountered the teaching that the most important requirement for perfection is to sell off one’s possessions and give the proceeds to our impoverished brethren, to spare no thought for the present life, and for the soul to lack all inclination for the things of this world, I prayed to find one of the brethren who had chosen this way of life, so that I could pass the brief storm of this life on earth with him”. And since his friend Gregory, despite their agreement, did not follow him into the desert, Basil distributed the greater part of his possessions among the poor and, in 360, set out alone to Pontos, to his family farm, on the River Iris, where his sister and mother were living the ascetic life. Here they had established two small monastic communities, one for men, the other for women. 1. We must strive after a quiet mind. Just as the eye cannot ascertain an object put before it if it wanders restlessly up and down and sideways, without fixing a steady gaze upon it, so a mind distracted by a thousand worldly cares will be unable to clearly apprehend the truth… Now, one way of escaping all this is withdrawal from the world, that is, not bodily separation, but the severance of the soul’s affection for the body, and to live without city, home, goods, society, personal possessions, means of living, business dealings, or human learning, so that the heart may receive every imprint of divine teaching. To prepare of the heart involves unlearning evil doctrines. It is smoothing the wax tablet before attempting to write on it. Now, solitude is of the greatest use for this purpose, inasmuch as it stills our passions, and gives our reason the opportunity to uproot them from the soul. For just as animals are more easily controlled when they are tamed, so lust and anger, fear and sorrow, the soul’s mortal enemies, are better brought under the control of reason, after being calmed by inaction, and where there is no continuous stimulation. What state can be more blessed than to imitate on earth the choirs of angels? To begin the day with prayer, and honour our Maker with hymns and songs? As the day brightens, to undertake our labours, praying all the while, and to season our work with hymns, as if with salt. Soothing hymns compose the mind into a cheerful and calm state. Quietude, then, as I have said, is the first step in our sanctification. The tongue purified from the gossip of the world; the eye unexcited by beautiful colours or appealing shapes; the ear not relaxing the tone of mind through subtle songs, nor by that particular mischief, the talk of light-weight men and jokers. So the mind, saved from dissipation from the outside… falls back upon itself, and thereby ascends to the contemplation of God”.